Baan Silapin Artist's Home is one of Bangkok's great hidden gems without aney social media presence. It still maintains elements of new and traditional Thai culture with daily puppet show. Why Baan Silapin Artist's House is special ? 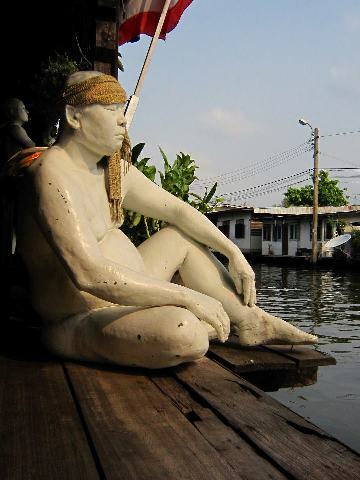 Located along a canal on the Thonburi side of Bangkok, the Artist's House (Baan Silapin) is a difficult attraction to find and just finding it has a little taste of success. A couple centuries ago, this kind of old Thai wooden house was very typical along the klongs but today these are becoming rare, inexorably replaced by concrete buildings. Not only has this one been beautifully restored, it also has some unusual features that always catch the eyes of tourists passing by on speeding boats: Several human-sized statues painted in white, red or black sitting by the water, endlessly staring at life passing by, like the ghosts of the original occupants who probably used to do the same, when smartphones didn't yet distract us from the real world around us. What to explore at Baan Silapin Artist's House? Not only beautiful in a rustic way, it also has a tall white chedi dating all the way back to the Ayutthaya period standing in the backyard. How many houses have their own 600 year old chedi? The place has a modest coffee shop but the main reason for people to come all this way despite the difficulty is the rare traditional Thai puppet show, performed with delicately crafted puppets that used to be part of the now defunct Joe Louis puppet theatre at the old Suan Luan night bazaar. These puppet shows are now really hard to find but one of them is still available at the Askra Theatre at the Pullman Hotel and soon at the giant Asiatique shopping village. 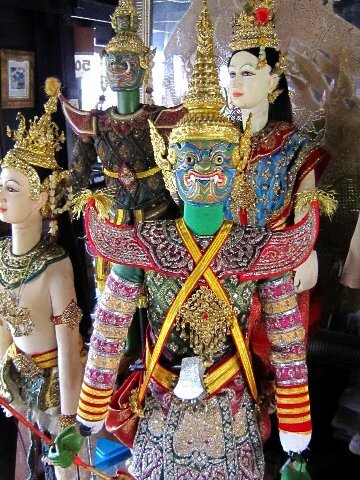 The traditional Thai puppet show is performed at 14:00 every day except on Wednesday. On a small wooden stage in front of the white stupa, intricately-made puppets are manipulated by several artists all dressed in black. It's fascinating how the story captures your imagination; your brain erases entirely the performers in black and soon the puppets take on a life of their own. The four rows of chairs are always full and people sit casually on the floor around the stage, just like it used to be long time ago. Each day a different story based on Thai folklore is narrated, involving mythological creatures and deities, often including Hanuman the monkey god. A calendar is available but if you really want to see the show, it is recommended to call in advance as the theatre sometimes performs outside for special events. The Artist's House is open every day, usually from 09:00 to 18:00. It houses a cafe and a shop selling fun stationary, postcards in addition to an art gallery displaying paintings, masks and, of course, puppets. Occasionally a boat selling food stops by and you can order your own lunch and use the house tables to enjoy your meal. It has the feel of village life around here: teenagers hang by the canal, feeding swarms of hungry fish with colorful food pellets sold in shops around while old people sit by the river and drink beer... it's a unique chance to dive back into a time that no longer exists. How to get to Baan Silapin Artist's House? To get there you probably have to get a motorbike taxi to drop you from Wongwian Yai BTS station to Wat Kuhasawan, the nearby temple, and from there walk along the canal and probably ask around... or use your mobile map. It's hard to find but it's really worth it! An off- the - beat- path stop. The show is free of charge, but they do accept tips and donations. For those who go with kids. Plain papier-mâché masks are available to purchase and you can enjoy the show while wearing the mask. If you would like to support the artists especially the puppet show, you can enjoy this friendlyriverside community. Let's start up our slow lives!